Corinne’s Fin is a children’s book written by Dayle Dabney and illustrated by Ashley Teets. Corinne is a goldfish who swims well in Lavender Lake, where fishing is strictly forbidden. Her bulletin board at home is covered in gold medals, as she wins every swimming tournament. One day while practicing her swimming, not long after mentoring a group of tiny fans, one of Corinne’s fins was badly damaged when it snagged and tore off on a fishing hook; somebody had broken the law and was fishing in a no-fishing pond! Without her fin, Corinne was only able to swim in circles, leaving her very sad. While some of her friends cried with her, seeing only what Corinne had lost, her one optimistic friend taught her some new skills to build up her confidence once again. Seeking out things she could do rather than focusing on things that she couldn’t, Corinne finds not just one, but two more things she is great at and uses those skills to help others. Corinne’s Fin touched close to home for me in so many ways, as I had faced the same dilemma when a head injury stripped me of my hearing and most of my eyesight. The illustrations in Corinne’s Fin are vivid and stunning, complementing this incredible story of greatness, tragedy, sorrow, acceptance, and finding a new path. Dayle Dabney’s message that we are not one-trick-ponies, and have many qualities which we can fall back on if we just look, is a great one. 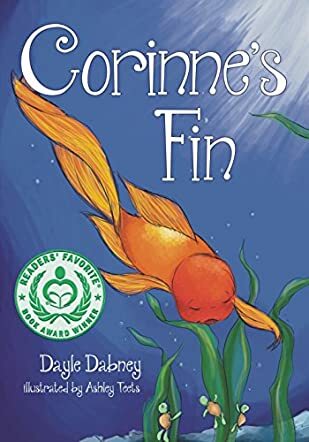 Corinne’s Fin is a tale of courage and determination, and while it is aimed at children, I could not help but smile at the way it was presented. I recommend this book to children of all ages, as well as to those who have suffered a life-altering event and need a little guidance. Great job!